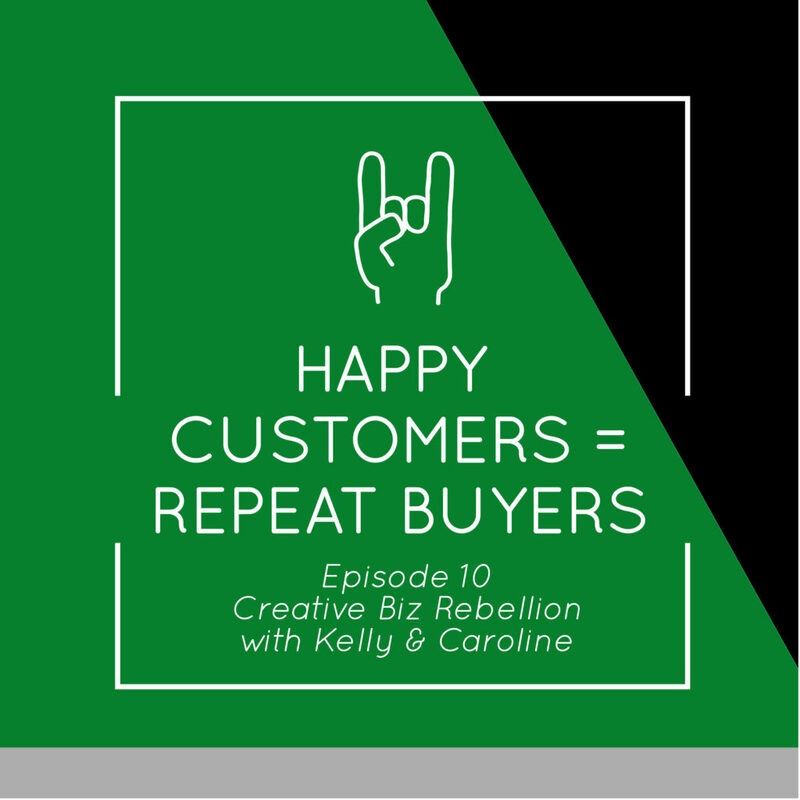 In this episode Caroline and Kelly talk all about how happy customers = repeat buyers! Learn great tips and tricks that they use to keep their customers happy and coming back to their shop! Kelly & Caroline talk about the great tips they use to keep customers happy! Want your customers to come back, want your product to be so awesome people can’t shut up about? Follow these great tips Caroline & Kelly offer! Kelly and Caroline both include these to help with their response and shop process time! If you use Etsy they have snippets you can use to respond, highly recommend, and if you have Shopify, they send emails automatically to customers. If you find yourself repeatedly typing the same responses over and over, stop, take the time to create a canned response for it! Dump them in a google folder if you have to and create it later! Kelly’s is obsessed with text expander – a new tool for you to set up text your repeatedly type! Find out all about it here! Caroline and Kelly talk about how important it is to send your customers coupon codes after their first purchase! It doesn’t have to be a huge, 10% off, free shipping, etc….! Learn about how important it is to market your products as gifts to keep customers coming back for more! Does your shop offer gift wrapping? This does not have to be elaborate. Kelly and Caroline talk about how their packages get shipped to their customers! You want the customer to be excited when they get their package! This is important-make your package seem like a present, customers don’t get to interact with you-so you want them to remember it and be excited! What else can you add to your packaging for your customers? Do you have biz cards or social media cards that you include into your packages? Kelly and Caroline talk about what they use, what they include, and why these little inserts are so important! They also talk about how they also take it one step further and share customer photos of their product on their social media pages! Don’t have this yet for your biz? Find out what your niche markets are and offer a program that is unique to them! Kelly talks about her two programs she uses for her biz…The Real Estate Frequent Buyer Program and the Creative Professionals Repeat Buyer Program. How does she keep them coming back, how does she keep track of her repeat buyers, and what great offers does she have for them? Caroline’s program is slight different based on her biz….what does she offer to get people to buy more cards at once? How can you continue to sell to the same customer over and over again? Caroline and Kelly talk about how it is so important to market to all different stages of life such as, weddings, new homeowners, new babies, etc… Caroline also creates a Creative Gift Guide with her own products from her shop to help her customers in all stages of life! Once your customers receive their package send them an email…reach out to them and see how they are doing…..maybe they have issues you can avoid right away! Talk about great customer service…this could eliminate any bad reviews. What other great tips do Caroline and Kelly give about ways to reach out and what you can talk to your customers about? SIDE NOTE: THIS IS OUR FIRST EPISODE SINCE OUR LAUNCH!!! FIRST 9 WERE PREVIOUSLY RECORDED! Big stuff coming soon for Creative Biz Rebellions! Hey ladies! I have a question kind of related to this episode. (At least I think it was from this episode?) Caroline mentioned that she uses another company to drop ship some of her orders so that she doesn’t have to store inventory. I’m thinking of starting to do that with my coffee mugs and maybe some other items through Printed Mint. How does that work though, if someone places an order on Etsy for something that you keep in stock, and in that same order they purchase an item that would need to be shipped from the 3rd party company? I’ve always been scared that I would get an order like that and not know what to do! I’m just curious how you handle that. Yes Ashley! Love this question. So you just need to make sure you have your shipping set up correctly and then I mention in the listing that it ships separately. When I’m shipping multiple boxes, I just print out a couple of packing slips and mark what is in each box. The key is to be sure your shipping times, prices and processes are clearly marked and stated. I love Printed Mint! Their packaging is divine! While I love 3rd party shipping, the profit margin is less so something to think about. Hope that helps!